Field trip to 'Dogwood' at Kuri Bush. Dogwood at Kuri Bush is a c.5ha remnant of mixed podocarp-broadleaf forest in a steep-sided gully on private land. It is in the process of being considered for a QEII covenant and one of the aims of this field trip is to contribute to a growing species list for the QEII report. The lower part of the gully at 20-30m above sea level is a kanuka-totara open forest with abundant lichens. Stock had access to this area up until c.15 years ago but regeneration is good. The highest point is 40m above sea level and the middle and upper areas have been fenced from stock for c.30 years or more. The size of many matai and totara trees suggests that core areas have never been cleared or logged completely. The gully itself contains typical species such as Fuchsia excorticata, Griselinia littoralis and tree ferns, but the slopes support less common dry forest with Hoheria angustifolia, Streblus microphyllus and Lophomyrtus obcordata. Two orchid species are relatively common – Pterostylis graminea and Corybas trilobus - and so far more than 20 species of ferns have been found. Bryophytes, lichens and fungi have not yet been explored. Birdlife is abundant with not only kahu, tui, bellbird, kereru, gray warbler and silvereyes but also shining cuckoo, the occasional falcon and possibly little owls. The stream is rumoured to contain koura but this has not yet been verified. Banded kokopu occur in a side catchment. 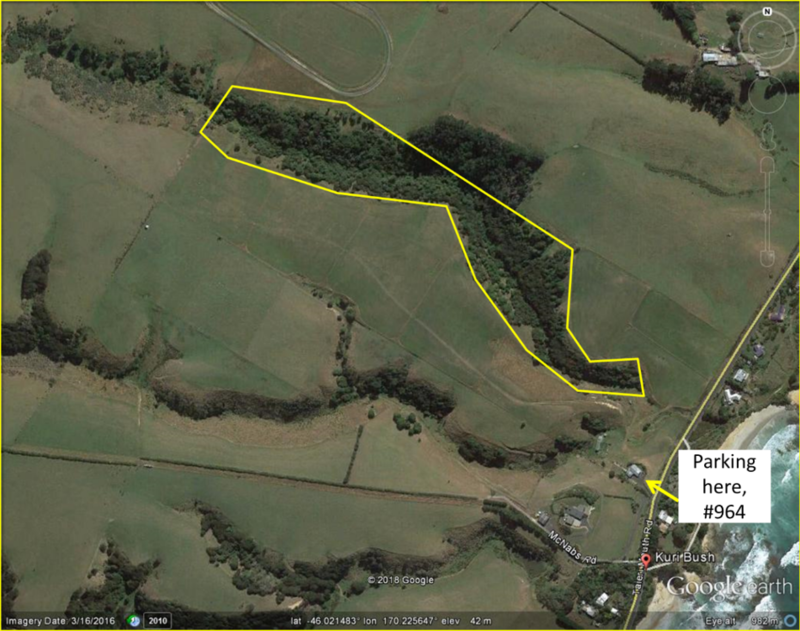 Access is via adjacent paddocks and a narrow track that follows the stream up until the mid-section. Access to the interior of the upper area is via a marked route which involves some steep sections and stepping over obstacles. Good footwear is essential. For people not inclined to scrambling, many species including dwarf mistletoe and orchids can be seen from the margins. Field trippers are invited to stop for a hot drink at the house after the expedition. Meet at Botany Dept 8.30 am to carpool or on-site at 9.10 am (see location map). Rain date Sunday 7 October. Contact Janice Lord phone 029 4881900. See NatureWatch for a current local species list.